Works Bell head office is located right in the heart of Tokyo in the Setagaya ward. Being very close to the original RHDJapan office in the same ward RHDJapan was lucky enough to meet up regularly and build up a great relationship with Works Bell. 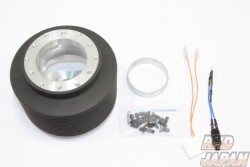 Works Bell is mostly known for their high quality boss kits, original short boss or Rapfix series of steering items. Incorporation started in 1983 and ...READ MORE since then Works Bell has created an extensive list of support for just about any JDM machine out there. Being able to start enjoying a vehicle normally starts with a sporty steering wheel.